This product is case packed in quantities of 48 per carton. A break carton fee of $11.00 will be applied to orders that are not placed in case denominations of 48 units. These salt shakers are a classic way for any home or restaurant to season their food. The saltshakers are great for holding salt, pepper, cinnamon and other finely ground spices on any tabletop or countertop. The shaker is made from glass with slightly angled sides to make gripping the holder easy. This style of glass holder is popularly used in buffets, restaurants, cafes, and coffee shops to provide customers with additional seasonings. 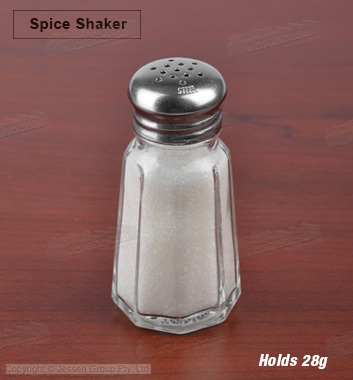 The glass hospitality displays, salt shakers can hold up to approximately 28g of a spice in the container, more than enough to last for a while without constant refilling. The top of the holder has a stainless steel lid with multiple holes to easily spread the seasoning. This lid can be screwed off for when you need to refill the container. Click here for access to our online catalogue, full of hundreds of products in many categories that can be used to outfit your business in style without breaking your budget! Despatch is provided to anywhere in Australia, including Sydney, Melbourne, Perth, Adelaide, Brisbane, & Gold Coast, with most in stock items purchased by 1pm EST, only from Slimline Warehouse!